Built into every Bar Crusher boat, the Quickflow water ballast system is one of the plate-aluminium boat brand’s most distinguishing characteristics. The ingenious and inconspicuous design feature solves the seemingly eternal problem of ‘smooth ride vs stability at rest’. 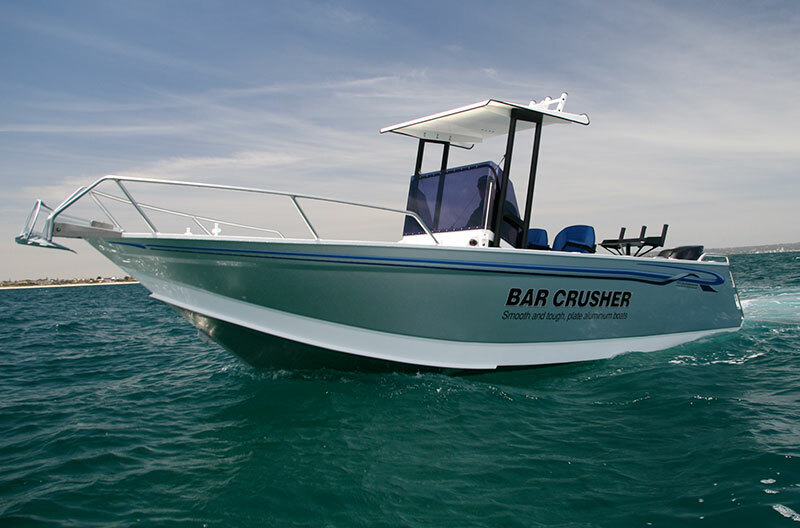 Bar Crusher’s Peter Cleland said while the technology was inherent to every boat the company had ever built, current consumer demand had confirmed the market’s acceptance. “A deep-V hull provides a smooth, soft ride in all conditions, while a flatter hull with a shallow V is much harder riding when the wind comes up,” Mr Cleland said. “Our trademarked Waveslicer deep-V hull design ensures every Bar Crusher boat rides beautifully in 20kt of wind, should you have to run home in those conditions, whereas most of our competitors’ boats just about pound you through the floor. The Quickflow system is comprised of a cavity that runs the full length of the keel (open at the transom) which quickly fills with water when the boat stops, lowering the chines into the water. This lowering of the boat sees the outer corners of the hull just sitting in the water, which provides incredible stability, even in less than favourable conditions. The ballast water is jettisoned in seconds as the boat moves forward to allow it to leap effortlessly onto the plane, faster than many other boats. “A smooth, non-pounding ride and excellent stability at rest is an important aspect when buying any offshore boat,” Mr Cleland said.